Cryptocurrencies, just like most major currency pairs, spent all the time in a sideways trend. It seemed in the middle of the week that the bulls took over, and the long-awaited growth of bitcoin, ethereum and other altcoins finally, started. But ... the pairs returned to the values of the beginning of the week. So, the result of the past seven days can be considered inconclusive both for the bulls and for the bears. EUR/USD. Graphical analysis on D1 believes that the pair completed the previous five-day period in the Pivot Point zone of the side channel, in which it will stay for the next few days. The boundaries of the channel are 1.2215 and 1.2355. 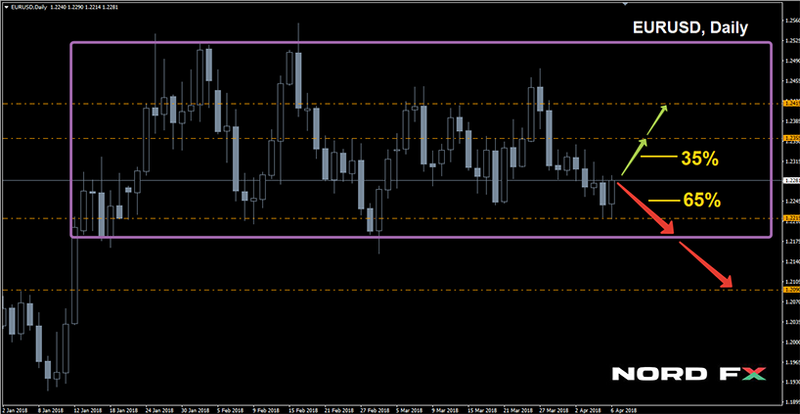 The most likely breakthrough is to the south and a decline to zone 1.2090-1.2150. Almost 65% of experts agree with such a scenario, supported by indicators on D1. As for cryptocurrencies, it is useless to try to determine the exact levels, considering their super-high volatility. One can only talk about the direction of trends and approximate targets. In the coming week, experts expect that the bulls' efforts will still be rewarded, and starting Monday, April 09, the main pairs may expect growth, although small and temporary, BTC/USD: rise to 7,820-8,360. For the ETH/USD, the target is the zone 440-511, LTC/USD: 155-175, XRP/USD: 0.56-0.67. Dear traders, brokerage company NordFX offers you the opportunity to earn both on growth and on the fall of cryptocurrencies, using a leverage ratio of up to 1:1000. Also, you can just invest in cryptocurrencies on favorable terms. Deposit and withdrawal of funds in USD, bitcoins and ethereums.